On of most beautiful of all of the Peonies is ‘Coral Charm’. This is an early flowering herbaceous peony with coral pink flowers. Semi double and chalice shaped, this is a peony that changes colour as at ages. The large Coral Pink flowers fade to a peach colour and eventually turn to a yellow. This is a strong growing variety that is easy in the garden and one of the most popular with cut flower growers. Look for large rooted cuttings with around 5 eyes if you are buying in autumn, this will help guarantee a good show of flowers in spring. Smaller plants may take a few years to reach full flowering potential, however this is a long lived plant and well worth the wait. Like all peonies, ‘Coral Charm’ prefers a humus rich soil with plenty of lime. They do like a cold winter and perform best in these conditions. Choose a position in full sun, or with a little afternoon shade, the plant will reach around 1 metre in height once established and will need around 80 cm to 1m to spread. Prepare the planting hole by digging over an area twice a big as what is needed. Dig in some well rotted compost, some aged cow manure and a good 4 cups of dolomite lime. The new plant should be watered in well and kept moist from when the first shoots appear right through flowering. After flowering, little extra water will be required. Although peonies hold their foliage right through summer, the root systems shut down, this lessons the amount of water required for survival. 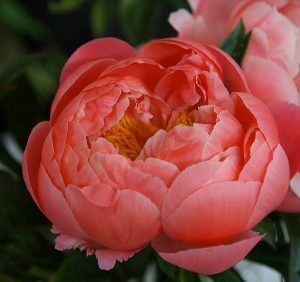 Peony ‘Coral Charm’ is available for sale from the following participating nurseries.